What makes this show interested is that this set in the Mother of All Courts, the Federal court where only the most high stakes cases are tried. We get introduced to the lawyers defending those cases, as well as get insight into their personal relations among themselves. Where can you stream For the People? On 2018-03-13 Drama TV Series For the People first aired on ABC. 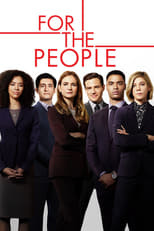 Written and created by Paul William Davies, and produced by ShondaLand & ABC Studios, For the People will return and was last broadcasted on 2019-04-11.